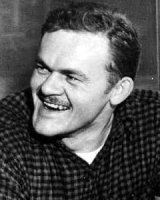 James Ramon Jones (November 6, 1921 – May 9, 1977) was an American novelist known for his explorations of World War II and its aftermath. He won the 1952 National Book Award for his first published novel, From Here to Eternity, which was adapted for the big screen immediately and made into a television series a generation later. James Ramon Jones was born and raised in Robinson, Illinois, the son of Ramon and Ada M. (née Blessing) Jones. He enlisted in the United States Army in 1939 at the age of 17 and served in the 25th Infantry Division, 27th Infantry Regiment before and during World War II, first in Hawaii at Schofield Barracks on Oahu, then in combat on Guadalcanal at the Battle of Mount Austen, the Galloping Horse, and the Sea Horse, where he injured his ankle. He returned to the US and was discharged in July 1944. He also worked as a journalist covering the Vietnam War. His wartime experiences inspired some of his most famous works, the so-called war trilogy. He witnessed the Japanese attack on Pearl Harbor, which led to his first published novel, From Here to Eternity (1951). The Thin Red Line (1962) reflected his combat experiences on Guadalcanal and Whistle (posthumous, 1978) was based on his hospital stay in Memphis, Tennessee, recovering from surgery on an ankle he had reinjured on the island. Jones was the father of two children including Kaylie Jones, an author best known for A Soldier's Daughter Never Cries, a thinly veiled memoir of the Joneses' life in Paris during the 1960s. (The son Jamie Jones was adopted in France.) Kaylie Jones' novel was made into a film starring Kris Kristofferson, Barbara Hershey and Leelee Sobieski in 1998. The release of this film, along with the 1998 release of a new film version of The Thin Red Line, directed by Terrence Malick and produced by Robert Michael Geisler and John Roberdeau, sparked a revival of interest in James Jones' life and works. In 2011, Ms. Jones was instrumental in publishing an uncensored edition of James Jones' From Here to Eternity. Jones assisted in the 1950 formation of the Hanby Writers' Colony in Marshall, Illinois, by his then-lover Lowney Hanby and her husband Harry Hanby. It was funded partly by Harry and, after the financial success of From Here To Eternity, partly by Jones. Originally conceived as a Utopian commune where budding artists could focus exclusively on their writing projects, the colony dissolved after only a few years, because James Jones relocated to France following his marriage to Gloria Mosolino after a fight with Lowney leaving the colony back in a financially compromised situation in 1957. Jones died in Southampton, New York, of congestive heart failure and is buried in Poxabogue-Evergreen Cemetery, Bridgehampton, New York. His papers are now held at the Harry Ransom Center at the University of Texas at Austin. His widow, Gloria, died on June 9, 2006. Many of James Jones's books are still available in digital format including excerpts from They Shall Inherit the Laughter, published as To the End of the War. Jones called his first novel They Shall Inherit the Laughter. It was a thinly disguised autobiographical novel of his experiences in Robinson immediately after World War II. After several rejections—with various complaints and claims about the work being too shrill and lacking perspective—he abandoned it and began writing From Here to Eternity. Charles Scribner's Sons published Eternity in 1951, and it won the annual U.S. National Book Award for Fiction. The Modern Library Board later named it one of the 100 best novels of the 20th century. His second published novel, Some Came Running (1957), had its roots in the abandoned first effort. In contrast to Eternity, it was savaged by critics. They were especially harsh about the frequently misspelled words and punctuation errors; they didn't recognize that such elements were a conscious style choice by Jones to evoke the provinciality of the novel's characters and setting. Jones apparently played around with this style in several short stories written at about the same time as Some Came Running (later collected in The Ice-Cream Headache and Other Stories), only to abandon it by the time he finished The Thin Red Line in 1962, in favor of the blunt but more grammatically sound style most associated with him today. Some Came Running was immediately adapted as a film starring Frank Sinatra, Dean Martin, and Shirley MacLaine, which was critically acclaimed and nominated for five Oscars. His novella The Pistol (1959) was drawn from his military experience, not unlike From Here to Eternity and The Thin Red Line. Jones did not live long enough to finish his last novel, Whistle; he knew he was dying of congestive heart failure while writing it. However, he left behind copious notes for Willie Morris to complete the final section after his death, and Whistle was published a year later, in 1978. That completed Jones' war trilogy (the first parts being From Here to Eternity and The Thin Red Line), of which he wrote: "It will say just about everything I have ever had to say, or will ever have to say, on the human condition of war and what it means to us, as against what we claim it means to us." From Here to Eternity was adapted as a film of the same name in 1953; as a television miniseries of the same name in 1979; as a TV series of the same name in 1980. A musical adaption of the book opened in London in 2013. Some Came Running was adapted as a 1958 film of the same name. The Thin Red Line was adapted as 1964 and 1998 films of the same name. ^ "Cpl James Ramon Jones". TogetherWeServed. 2015. Retrieved 2015-05-22. ^ ''James Jones on Guadalcanal'' by RJ Blaskiewicz (PDF). Archived from the original (PDF) on 2012-01-30. Retrieved 2011-08-27. ^ "Profanity and more to be found in uncensored 'From Here to Eternity' e-book". LA Times. 2011-04-05. Retrieved 2011-08-27. ^ a b c Bosman, Julie (April 4, 2011). "Author's Heirs Uncensor a Classic War Novel". nytimes.com. The New York Times. Retrieved 2011-08-28. ^ "National Book Awards – 1952". National Book Foundation. Retrieved 2012-03-12. "I did attend one of the first National Book Award Ceremonies 40 years ago. That was also my last experience of book prize giving... The winner in fiction, was my old friend James Jones, From Here To Eternity. His victory was somewhat marred by Jean Stafford, one of the [five] judges, unlike our present distinguished company, who moved slowly, if unsurely, about the room, stopping before each notable to announce in a loud voice, "The decision was not unanimous." "National Book Awards Acceptance Speeches: Gore Vidal ..." Archived 2012-03-08 at the Wayback Machine. National Book Foundation. Retrieved 2012-03-12. ^ Modern Library. "100 Best Novels". Random House. Retrieved 2012-03-31. ^ Williams, Tony J. (2016). James Jones: The Limits of Eternity. Lanham MD: Rowman & Littlefield. pp. 231–33. ISBN 978-1442272408. Retrieved 28 February 2017. ^ "Tim Rice musical set for West End". bbc.co.uk. BBC News. 26 October 2012. Retrieved 25 June 2013. James Jones Papers. Yale Collection of American Literature, Beinecke Rare Book and Manuscript Library. Handy Writers' Colony Collection. Archives/Special Collections, Brookens Library, University of Illinois at Springfield. This page was last edited on 9 March 2019, at 04:02 (UTC).